The house backs up to wetlands that will never be developed which I absolutely love, but I did not love the creatures of said wetlands being all up in my backyard. I have three little boys and the amount of snakes and other not so kid-friendly inhabitants made it a no-play zone at first. My husband clearing the thick brush in the rear of our lot last summer. 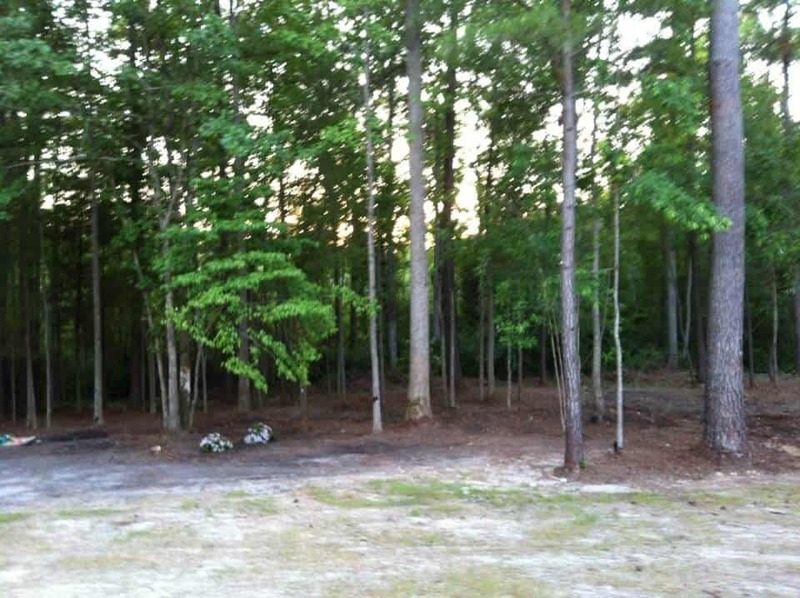 The first step we had was clearing a lot of the brush and the trees that were not healthy. We rented some machinery and bought a chainsaw and my husband set to work. I thought I’d help but after the first snake sighting I thought I just better take the kids on inside and “supervise!” It was a crazy amount of work but my husband really came through and cleared out a lot of the junk. For the first time you could kindof see there was a yard there waiting to happen! Starting to cut down some of the trees to create a more open area. By July we were baking in the NC sun and decided to take the “plunge” (lol) and have a pool put in! It was a two month long process due to the weather not cooperating but it was completed in August and immediately afterwards we had a fence put up. We opted for a six foot wood privacy fence on the front and sides and black metal along the back to keep our wetlands view unobstructed. We also had the black fence put up around the pool area for obvious safety reasons. This was a huge leap for the yard-I could finally let the kids out to play without having to be right there with them which is HUGE for me getting things done on nice days! Unfortunately the heavy equipment used to put in the pool destroyed a lot of our side and backyards and the pool contractor did not do any grading around the pool leaving us with a bit of a weird situation in the surrounding areas. As the weather cooled in the fall I seeded the yard with grass and hoped for the best! We also added in a tire swing and sandbox for the boys. So that pretty much brings us up to this month. We had a lot of rain a few weeks ago and ended up with a large area of standing water in the backyard…perfect for 100 pound golden retrievers and little boys to romp in every. single. day. Yeah. No fun. We knew we needed to address that area of the yard and we were also left with this horribly graded clay area next to the pool that was way too hard to dig in let alone seed with grass. 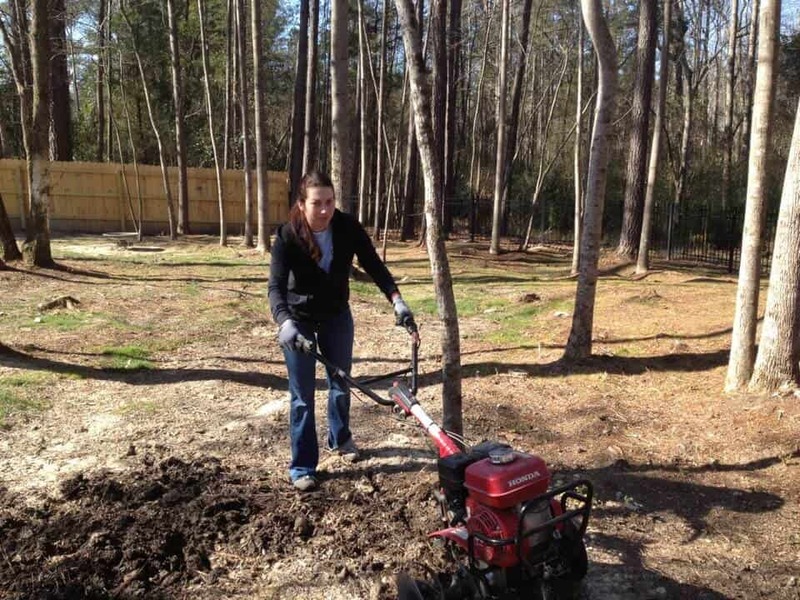 So two weeks ago we rented a rototiller and got to work! We tilled the dirt by the pool and graded the area so that water would run away from the concrete surrounding the pool. We had to remove a lot of dirt to get the area level so that was all dumped over in the low lying areas. Then we moved our attention to the standing water. We dug a few trenches to let the water drain out of the yard (there is a very poorly graded drainage ditch just on the other side of our fence). Then we used the rototiller to till up a gardening area for me and grade some of the uneven areas of the yard that were causing the water to pool. It was a big improvement! This past weekend we went even further though and ordered two pallets of sod, pallet of fill dirt, and rented a yard roller. 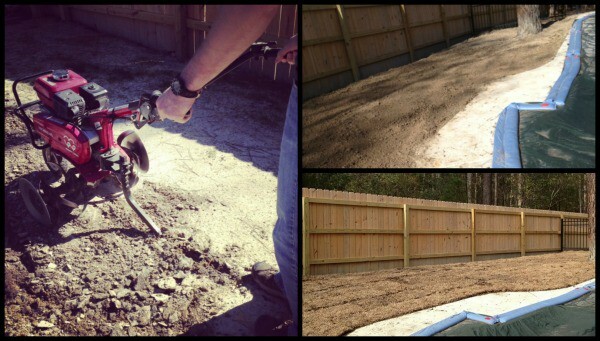 Bright and early Saturday morning we laid sod in the area by the pool-what an instant gratification project!! Then we used the remainder of the sod to patch in the areas in the side yard that the construction equipment destroyed when building the pool. Sunday was spent adding fill dirt to the low areas of the yard and rolling it to pack it. (I do admit that the kids and I got sick that day so really contributed nothing to this process-it was all my husband-I’m a lucky lady!) There are still some wet areas but the improvement is huge. We may need to add a little more dirt soon but unfortunately it looks like rain for the next week straight so I guess we’ll see how the water drains and then decide. Rolling the fill dirt in the areas of standing water. 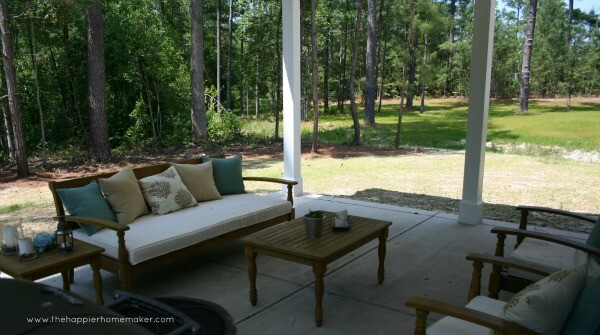 Have you started refreshing your outdoor areas yet this year? What’s on your list? What amazing progress! It’s really taking shape. You look thrilled in the tilling picture, by the way. What is going to go in your garden? Veggies? Flowers? Does it get full sun? Hey Karen! I am aiming for a flower cutting garden primarily…it gets a good amount of sun but because of all the trees I have to be very particular about where I plant things (certain spots get shade from the trees) My four year old planted four strawberry plants that he is extremely excited about and I have a lilac and forsythia back there. We also just seeded zinnias and poppies. I have some more flowers and herbs I started inside I need to transplant soon. We’ll see how it goes! Melissa, your back yard looks wonderful and that pool is gorgeous! All of that space is so great….a lot of work though! It is fun to have a garden, and you reminded me that I have a lot of work to do in my own little garden! Can’t wait to see what you plant! Thanks Cindy! I try desperately to have a green thumb but it does not come naturally to me so I’m hoping I have at least a little something decent to show in the garden in a few months! Time will tell! No yard work for me yet…still very cold. You have done so much already! Your pool is fabulous too. Looking forward to seeing the rest of your plan take shape! Wow, girl! Yall have already done a ton! You have worked hard to make your backyard so much more inhabitable 🙂 Love the pool and your plans for the garden! Lots of spring work to do; we’ve been cleaning yards and trimming dead limbs, getting a place fixed for a small garden. Sunshine refreshes you and is good for you; but the back breaking work is hard on old bodies. LOL But I love it when you can sit outside and see what you have accomplished. That settles it- coming to ur house for vacation! Lol. Love your yard and pool!! Very nice. 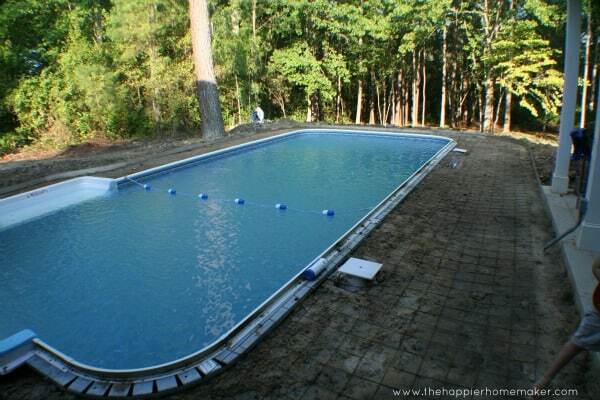 Can you tell me if your pool is a fiberglass pool? I have been wanting to install a pool in my yard and fiberglass pools are so much quicker than the concrete custom ones. 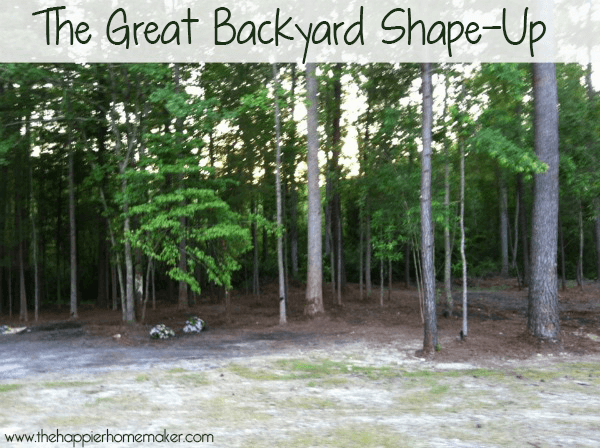 Melissa – Impressive yard and landscaping project! The post is terrific and the pictures really help tell the whole story. Kudos to you and the ‘team’ for putting in the work and transforming the outdoor areas. Bet you’re pleased with the results! Thanks so much, it’s a process but we’re getting there! Have a great weekend! The good thing is you already have a large number of mature trees out back, or at least it looks that way. Just think how long it would take to grow all those trees from scratch to end up with how it already looks. of the latest modern gadgets like blenders, juicers, modern ovens, steamers and the like. or pans. While you’re around thhe web already, it will pay off to perform some research. I don’t remember exactly Larissa (it was at our last house a few years ago) I believe we wrapped up all the fencing for the yard and the pool into one payment around 25K…this was in North Carolina. It took them about a month to build it. This sounds like our life right now!! So for the standing water issue, did you put in a drain or just do the fill dirt? How has that been working? And what machinery did you rent? We actually haven’t lived in that house for two years but I went back there last month to prepare it for sale and the water was still there-we had french drains put in but apparently there was an underground spring so it was never going to dry out. I planted bog plants all around it for landscaping (and to keep my kids out of the muck) but our renters had let the area become quite overgrown. We hired out the french drain install, not that it ended up helping.